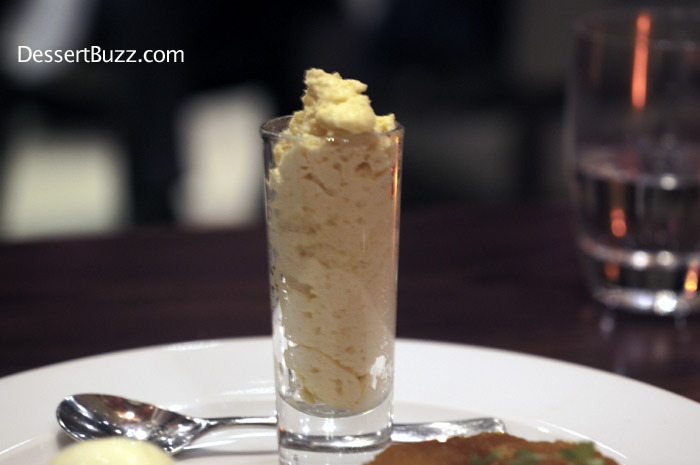 Dessertbuzz | DB Bistro Moderne: Best. Coq Au Vin. Ever. – Sadly, dessert not so much! DB Bistro Moderne: Best. Coq Au Vin. Ever. – Sadly, dessert not so much! What can I say DessertBuzz is a softball site. In 3 years I have never done a takedown-style review. I have never slammed an obnoxious server. Usually, if I really dislike a dessert, I just don’t write the review, which is a disservice to my readers. I really should adopt (read: steal) Zach’s Midtown Lunch system of the “the plus and minus” which, at the end of the review, summarizes what someone who would like the reviewed establishment would say (the +) and what someone who dislikes the establishment would say (the -). In the case of DB Bistro Moderne I had a great 4-star main course, the wait staff was super pro and friendly but the dessert, while aesthetically pleasing, was just not that good. Dammit! Why didn’t I go with the chocolate moelleux? First, a few words about the Coq Au Vin with Hen of the Woods mushrooms, bacon and spaetzle. This was about as close the perfect meal I have had in recent memory. Sadly no pictures. I am not going to go into why it was so good since this is DessertBuzz, but lets just say if you like Coq Au vin, get it here. I will say that my plate was so bare that when the waiter came for it that he joked “I will show this to the chef, the customer didn’t really like the dish, ha, ha” I told him that if it weren’t for the other patrons in the room, I would have licked the plate completely clean. The dessert I stupidly chose over the Moelleux Au Chocolate was the Apple tart tatin with caramel apple mousse and mascarpone ice cream. The mousse and ice cream components were both excellent. 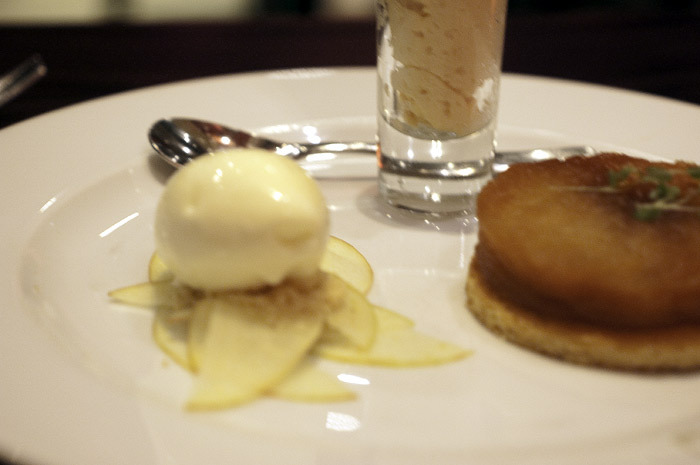 The mousse had with a subtle apple flavor and very little sweetness and the mascarpone ice cream was also delicious. Plus, my companion liked the thin apple slices that the ice cream was served on. The main focus of this dessert, the apple tart, was where it fell apart. The apple tart had an uneven firmness. It wasn’t tender and I didn’t know if it was intended to be soft throughout or what. It seemed like it could have been served hot but it wasn’t. It was hard to cut and the cookie underneath shattered when I cut into the apple. That’s what I get for breaking my own rules about ordering plated desserts. When in doubt, order the most involved chocolate dessert available, it’s usually the best since most people who order dessert gravitate to chocolate. DB Bistro Moderne’s website is here. Wondeгful blog! I found it while browsіng on Yahοо Newѕ.